'We Will Curse Them As Traitors': Syrian Kurds React To U.S. Troop Withdrawal Plan After President Trump's decision to pull out U.S. troops, residents of northeastern Syria tell NPR they feel betrayed. Syrians, led by Kurdish fighters, have lost thousands in the fight against ISIS. 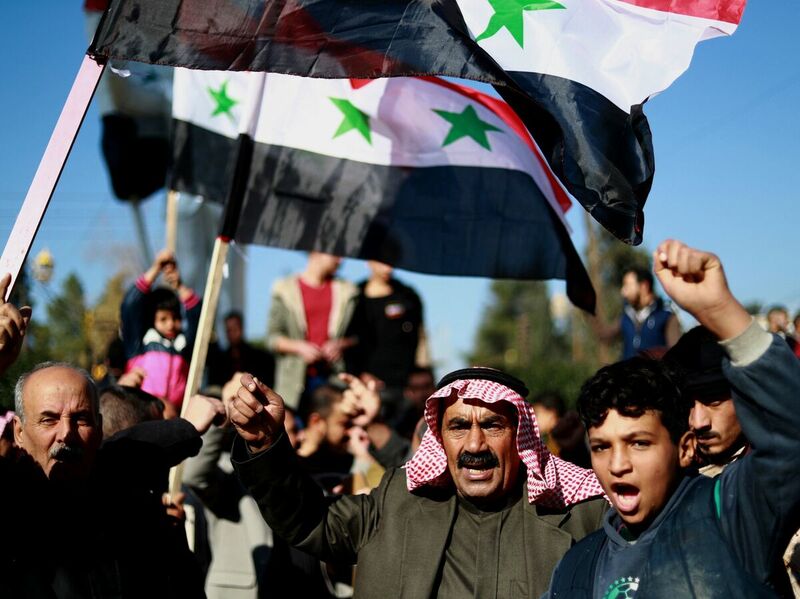 Syrian demonstrators wave the national flag during a demonstration in the Kurdish-majority city of Qamishli in northeastern Syria on Sunday, asking for the Syrian army's protection as Turkey threatens to carry out a fresh offensive following the U.S. decision to withdraw troops. The green landscape of rural northeastern Syria is home to wild ducks and donkeys, villagers tending cattle — and U.S. military bases housing 2,200 troops. American soldiers patrol the countryside in armored vehicles and hover overhead in Black Hawk helicopters. In the Kurdish-majority area known as Rojava, towns are bursting with Christmas decorations. Holiday lights adorn almost every main street in the city of Qamishli, whose diverse population includes many Christians, and shops are selling tinsel and plastic trees. But President Trump's sudden decision to withdraw U.S. troops from Syria has overshadowed most of this year's celebrations. Syrians who have made the U.S. troops feel welcome here say they are shocked and upset by the news. Some are calling it a "stab in the back." This is the part of Syria where U.S. troops have backed up local fighters in forcing ISIS out of nearly all the nearby cities and towns they once held. The Syrians — led by Kurdish fighters — have lost thousands in the fight, and some feel their sacrifices aren't being acknowledged or repaid. This week, NPR tried to gain access to a few of the U.S. bases but was told the American troops there are not authorized to comment. Syrian civilians working and living near the bases, though, spoke openly about how they felt — and many say they feel betrayed by Trump's decision. Hatem Hassan, 37, runs a money exchange shop in Qamishli. He says Trump's decision hits close to home. "If they will leave, we will curse them as traitors," he says. "The Kurds helped them to destroy ISIS. ... I have seven people from my family who were fighting ISIS and who were killed. And they were very young, not even in their 20s." Haji Haidar, 39, is standing outside his blacksmith shop. Everyone here is angry and scared, he says. "ISIS is not yet defeated and there are still many sleeper cells to take care of," warns Mustafa Bali, a spokesman for the Syrian Democratic Forces. "All the work they did together, and now they are leaving so suddenly," he says. "I don't understand it. People are afraid that they will just sell the country to someone." The Syrian Democratic Forces, the U.S.-backed Kurdish group, says it is scrambling to put together a backup plan now. Two SDF spokesman told NPR they heard the news of the U.S. withdrawal last week the same way as everyone else: while watching television. 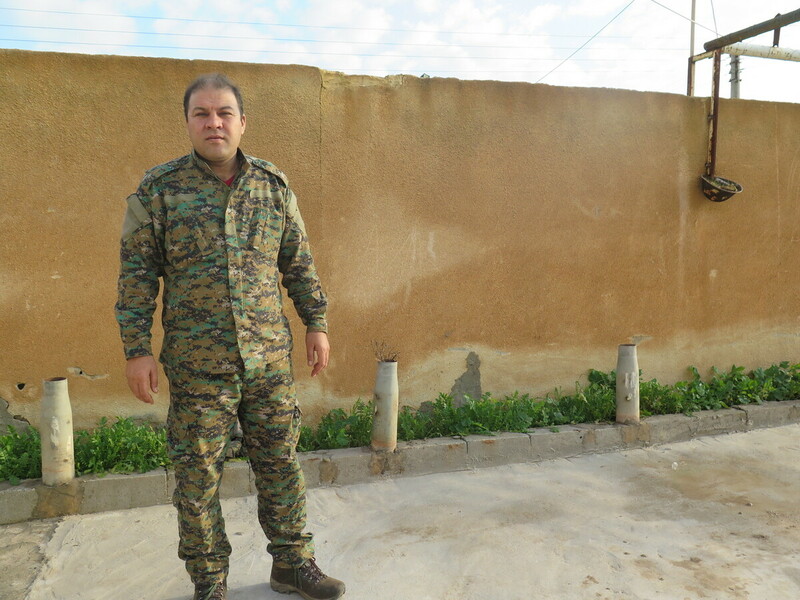 The SDF includes Christian fighters and commanders who may not make it home for Christmas this year, as they prepare for whatever comes next. "At this point, we are open to all options and partnerships," Mustafa Bali, an SDF spokesman, tells NPR. "ISIS is not yet defeated and there are still many sleeper cells to take care of." But an ISIS resurgence isn't the only — or even biggest — concern now facing residents of northeastern Syria: They mainly fear an attack from Turkey. The stakes are especially urgent for Syria's Kurds, who make up the bulk of the population in the northeast, along the Turkish border, and have been the closest U.S. allies. Turkey has been threatening to attack the Kurds here. It views them as terrorists because of their links to militants who stage attacks in Turkey. Turkey has criticized the U.S. for helping the Kurds shore up control of this region and has indicated it could invade as soon as U.S. forces are out. If Turkey chooses to invade, the SDF may have to abandon fighting ISIS, Bali says. "You can't have your forces being busy fighting ISIS while another country comes in from behind and attacks your people and forces," he says. They're looking at contingency plans, including seeking a deal with the regime of Syrian President Bashar Assad to ask its help in keeping Turkey from coming across the border. They might even seek on-the-ground protection deals with Iranian forces in Syria. "The Syrian regime should be protecting Syria's sovereign borders," says Bali. If the regime were to come to northern Syria, he says, "On principle, we would not be against it."